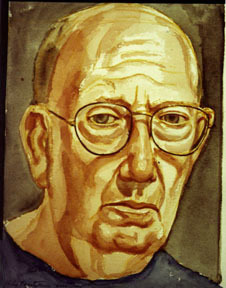 Philip M. Pearlstein was born on May 24, 1924 in Pittsburgh, PA, to David and Libby Kalser Pearlstein. During the Great Depression, his father sold chickens and eggs to support the family. As a child, his parents also supported his interest in art, sending him to Saturday morning classes at Pittsburgh's Carnegie Museum of Art. 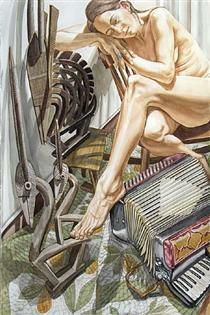 In 1942, at the age of 18, two of his paintings won a national competition sponsored by Scholastic Magazine, and were reproduced in color in Life magazine. In 1942, he enrolled at Carnegie Institute of Technology's art school, in Pittsburgh, where he painted two portraits of his parents now held by the Carnegie Museum of Art, but after one year he was drafted by the US Army to serve during World War II. He was initially assigned to the Training Aids Unit at Camp Blanding, Florida, where he produced charts, weapon assembly diagrams and signs. In this role, he learned printmaking and the screenprinting process, and subsequently was stationed in Italy making road signs. While in Italy, he took in as much renaissance art as was accessible in Rome, Florence, Venice and Milan, and also produced numerous drawings depicting life in the Army. 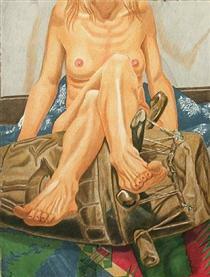 In 1946, sponsored by the GI Bill, he returned to Carnegie Institute, and first met Andy Warhol, who was attracted to Pearlstein because of his notoriety in the school, having been featured in Life magazine, as well as fellow student, and future wife, Dorothy Cantor. During the summer of 1947, the three rented a barn as a summer studio. 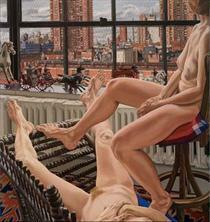 Immediately after graduating in June 1949 with a BFA, Pearlstein and Warhol moved to New York City, at first sharing an eighth-floor walkup tenement apartment on St. Mark's Place at Avenue A. He was eventually hired by Czech designer Ladislav Sutnar, mainly doing industrial catalog work, while Warhol immediately found work illustrating department store catalogs. In April 1950, they moved to 323 W. 21st Street, into an apartment rented by Franziska Marie Boas, who ran a dance class on the other side of the room. 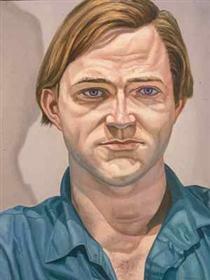 During this time, Pearlstein painted a portrait of Warhol, now held by the Whitney Museum of American Art. 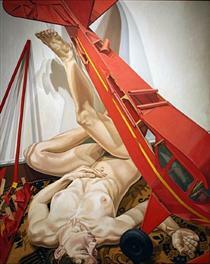 In 1950, Philip Pearlstein married Dorothy Cantor, with Andy Warhol in the wedding party. 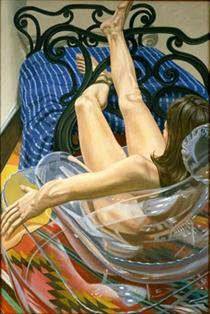 The Pearlsteins moved to East 4th Street, taking over an apartment from fellow figure painter Lester Johnson, and Philip enrolled in the Masters in Art History program at New York University Institute of Fine Arts. 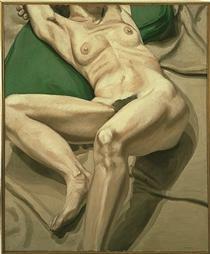 His thesis was on artist Francis Picabia, evaluating Cubism, Abstract art, Dada and Surrealism, graduating in 1955. After graduation, he was hired by Life Magazine to do page layouts, and was then awarded a Fulbright Hays fellowship, enabling him to return to Italy for a year, where he painted a series of landscapes. From 1959 to 1963, he was an instructor at Pratt Institute, in Brooklyn, NY, and subsequently spent a year as a Visiting Critic at Yale University in New Haven, CT. Finally, from 1963 to 1988, he was Professor, and then Distinguished Professor Emeritus at Brooklyn College, in Brooklyn, NY.